Cheltenham Walmart shooting suspect apologizes, bail set at $1M. Watch the report from Maggie Kent on Action News at 4 p.m. on August 15, 2018. CHELTENHAM TWP., Pa. (WPVI) -- A suspected gunman has apologized for a shooting that injured several people inside a Walmart in Cheltenham Township, Montgomery County Tuesday. The suspect has been identified as 30-year-old Keenan Jones. He faces charges of Criminal Attempt-Murder, Aggravated Assault, Reckless Endangering Another Person, Resisting Arrest, Possessing Instruments of Crime and Persons Not to Possess Firearms. The affidavit of probable cause says Jones has several prior felony convictions, which means he can't possess a firearm. He is being held on $1-million cash bail. The judge granted the district attorney's bail request believing Jones' history of intimidating witnesses in prior cases and fleeing police in this most recent incident indicates he is a flight risk. During his arraignment, Jones told the judge he hasn't slept in five days and ate food that made him "feel strange." He told the judge he suffers from mental issues and felt he was going to die "for no reason." In exclusive video obtained by Action News, Jones issued an apology as he was being brought into Cheltenham police station late Tuesday. "I'm sorry, man. I thought somebody was going to kill me," the suspect says in the video. Action Cam Video: Walmart shooting suspect says 'I'm sorry' as he's taken into custody on August 14, 2018. Investigators say after a dispute occurred at the checkout line, the suspect pulled a gun from a female companion's waistband and opened fire. The 25-year-old woman was taken into custody after the shooting. She has been identified as Jones' sister. Officials say she legally owned the handgun and will not face charges. Dozens of people were inside the store at the Cedarbrook Plaza shopping center on the 1000 block of S. Easton Road as the gunman opened fire around 6 p.m. The Cheltenham Township Police Department and the Montgomery County Detective Bureau obtained video surveillance from inside the Walmart and interviewed victims along with several witnesses. The surveillance, according to the affidavit of probable cause, shows Jones standing in the checkout line. He started to walk towards the back of the line, officials say, when he pulled out a gun and fired a single round at a man who was standing feet away, striking him. The district attorney's office says that by all accounts, Jones did not know the man. Jones began running through to the front of the store and surveillance shows him firing additional shots indiscriminately as victims, employees, and customers run for safety, according to the affidavit. Twelve-year-old Nicholas Hatcher was recording video on his cell phone when suddenly the first shot rang out. His mom, Rachel Suarez, said they made a dash for the door. "Everybody ran, and then the alarm came on," said Suarez. "I started to run. I was scared for my life." The surveillance video shows people, including elderly and young children, trying to escape the gunfire, officials say. During the incident, police say a pregnant customer was knocked to the ground and required medical treatment. Jaynee Davis, a nurse, said she tended to one of the shooting victims. "We didn't know if the shooter was in the store," Davis said. "We were petrified." A female employee told investigators she was standing by the customer service area when she thought she heard glass breaking near the registers. She decided to walk towards that area and as she got closer, she told police she noticed a man, later identified as Jones, walking away quickly with a gun in his hand, down by his side. Police say Jones then fired at the woman, striking her three times at close proximity. Chopper 6 captures multiple scenes from a police investigation into a shooting inside a Cheltenham Township Walmart on August 14, 2018. Arriving officers discovered five victims suffering from non-life-threatening gunshot wounds. Police say Jones fled the Walmart in a 2001 gold Pontiac Grand Prix. According to the affidavit of probable cause, a witness saw Jones exit his vehicle at Cheltenham and Mt. Pleasant avenues and discard a handgun along the divider of the roadway. Officers later recovered a 9mm semi-automatic handgun at that location. The magazine and chamber were both empty, police say, indicating that all rounds had been fired. According to the affidavit, Jones got back into the Pontiac and continued on Cheltenham Avenue towards Philadelphia. Jones, however, rear-ended an unoccupied, marked Philadelphia police cruiser parked on the side of the road along the 1300 block of E. Sedgwick Avenue. After striking the car, police say Jones left the Pontiac and ran away on foot. Two uniformed 14th District police officers, who were investigating an unrelated case, witnessed Jones hit their cruiser and gave chase. Suspect apologizes after Walmart shooting. Jeannette Reyes reports during Action News Mornings on August 15, 2018. 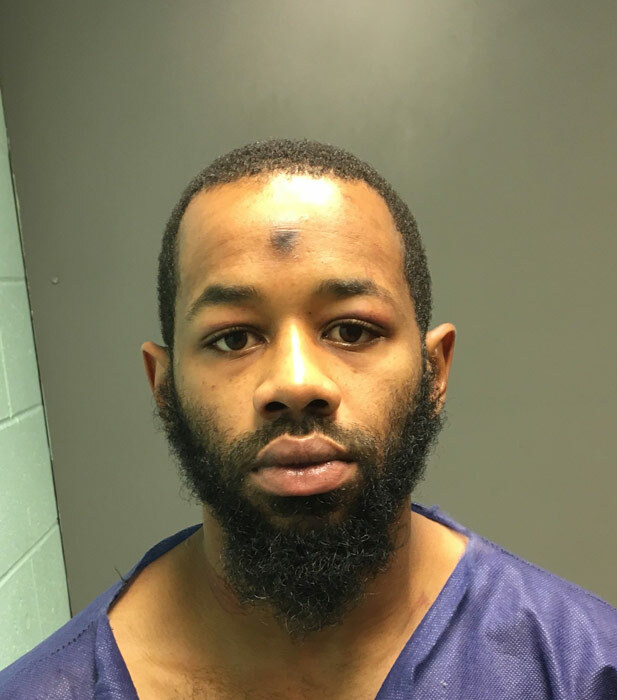 "It was a good job by Philadelphia police who happened to be at the right place at the right time; they made this arrest initially thinking they were arresting somebody for trying to leave the scene of an auto accident and then realizing it's a much more serious crime, a triple shooting," Philadelphia Police Chief Inspector Scott Small said. The affidavit says Jones resisted arrest and a violent struggle ensued. During the confrontation, one officer suffered a fractured right wrist and another suffered abrasions, contusions, a black eye, and a sprained ankle. Other officers arrived to assist and Jones was taken into custody. Authorities say following his apprehension, Jones attempted to kick out the window of the police vehicle and was subsequently shocked by officers with a stun gun. He was transported to Einstein Medical Center. During a forensic examination, police say multiple bullets were recovered from inside the Walmart. A total of eight EMS agencies and 22 police departments, including Philadelphia police and the Montgomery County SWAT team, assisted with the incident. "We are relieved that an arrest has been made and thankful that injuries sustained by three of our associates and a customer are non-life threatening. Local authorities acted quickly and did an outstanding job. Our focus remains on supporting our associates and continuing to assist law enforcement."